There was a time in my life, when I loved to fly. The airports, the cities, the people, oh what grand adventures they were. That was however, a time long, long ago, in an airline world, far, far away. Flying in today’s climate of TSA ridiculousness and airline incompetence is much more likely to be an adventure authored by Dante Alighieri than Mark Twain. I provide you now a personal case in point. We arrived at the US Airways gate with the flight board showing “on-time” and no issues. Not until retrieving valet baggage tickets did we learn it had been cancelled over an HOUR earlier but they just forgot to change the board. And with only one seat available across all flights the next day, overnight hotel vouchers were worthless as well. A visit to Enterprise rental only got us absolutely no budging from the over $250 a day rate for a Philly rental and Scranton drop off. So back to the airline. This time with an agent who had as much understanding of our plight as Lois Lerner at a Tea Party rally. Philadelphia may call itself the city of brotherly love, but the only love we were getting from US Airways was “we love your money, you…not so much”. As my voice was rising and my patience waning, a fellow aeronaut stepped up and in the calmest, matter of fact way, told me “oh they do this to us all the time here”. I realized then and there that as far as US Airways was concerned, we were grounded. We were on our own, and then, we weren’t. As a regular recipient of US Airways abuses, she already had a friend en route to pick her up and if we didn’t mind she’d be happy to call and see if he’d mind a couple of Midwestern tag-a-longs. Didn’t mind? It was she who was doing US the favor. It was she who was offering a ride to two total strangers. Who was this woman so recklessly offering kindness in an airport full of “who cares”? Introductions and pleasantries revealed her to be one Ann Pipinski, President of Johnson College, a small, two year technical college in Scranton. Over the next three hours I would learn of a woman dedicated to her school, her students and to education that actually accomplishes something. I learned of a college that rather than pumping out debt laden meaningless degrees, instead gives its students the skills and training necessary to secure real jobs supporting independent lives in the real world. And I learned that no matter how much ugliness US Airways threw at me that night, it was nothing compared to the memory that I would forever carry of one person, in one place doing what we all need a lot more of: a good deed for a stranger in need. The President’s section of the Johnson College website has a “Core Values” paragraph that reads: “We accomplish our mission with a commitment to ethics, honesty, trust, consistency, and fairness”. 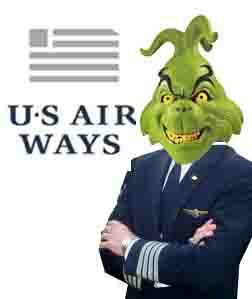 Too bad no one from US Airways will ever read it. I guess on one hand I should be thankful. At least US Airways didn’t single me out for the worst travel experience ever. Seems they’ve been practicing for years now. Publisher’s Note: A version of this column first appeared in the September 24, 2014 print edition of the Joplin Globe.